Attorney General's office says 'tens of millions' of dollars ordered to be returned; Grasso to appeal. NEW YORK (CNNMoney.com) -- A judge ordered former New York Stock Exchange chief Richard Grasso to repay part of his $187.5 million compensation package, a spokesman for New York Attorney General Eliot Spitzer's office said Thursday. Grasso said he plans to appeal the judgment. 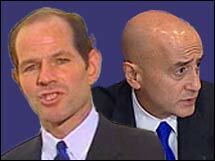 New York Attorney General Eliot Spitzer and ex-CEO of NYSE Richard Grasso. A spokeswoman from Spitzer's office "hailed" the decision, adding that the judgment means Grasso will have to give up "tens of millions." The summary judgment also dismissed Grasso's claims of defamation and disparagement against then interim CEO of the New York Stock Exchange John Reed, arising from the exchange's issue of a report on Grasso's compensation. John Thain came from Goldman Sachs (Charts) to take the helm of the NYSE in 2004. The judgment also dismissed Grasso's claim for $48 million in compensation he had not yet received from the NYSE before he resigned in September 2003. New York State Supreme Court Judge Charles Edward Ramos wrote in his 72-page ruling, "Mr. Grasso's failure to disclose the amount of [his compensation plan] thwarted the Compensation Committee from performing its duty of care and obedience." "Year after year, it made decisions to pay him without knowing his true compensation," the judge wrote, referring to the NYSE's compensation committee. "Mr. Grasso turns the law of fiduciaries on its head when he maintains that it would have been 'improper' for him to advise the board" about his compensation plan, Ramos wrote. "Not only does nothing preclude Mr. Grasso as CEO from making sure that the committee had all of the information it needed to make an informed decision, it was his affirmative fiduciary duty." "Given prior rulings by Justice Ramos we aren't surprised by today's decision," Grasso told CNN. "We plan to appeal his decision." Grasso's lawyers had previously sought to have Justice Ramos removed from the case, but the motion was denied, according to the spokeswoman for Spitzer's office. "It's an important ruling and does resolve some core issues in the case," said Michael York, lawyer for the New York Stock Exchange. "We thought there wasn't a factual basis for the cross claims [made by Grasso]," said York, who expects the case to be reviewed by the appellate division. In 2004, the board of the New York Stock Exchange issued its own report on Grasso's pay and urged the Securities and Exchange Commission and Spitzer to "pursue the matter both on our behalf and as part of your broader responsibilities." In a letter sent at the time to the SEC and Spitzer, interim NYSE CEO Reed concluded that "serious damage has been inflicted on the exchange by unreasonable compensation of the previous Chairman and CEO, and by failures of governance and fiduciary responsibility that led to the compensation excesses as well as other injuries." The pay package was at the center of a suit brought by Spitzer in 2004 against the former head of the NYSE. Spitzer prosecuted the exchange primarily under the New York Not-For-Profit Law because at the time it was a not-for-profit organization. The exchange became a for-profit corporation, the NYSE Group (Charts), in March 2006. Spitzer is the Democratic Party's candidate for governor of New York state.